On Thursday, Salt + Light CEO Father Thomas Rosica, CSB will be speaking at the University of Toronto's Newman Centre. Three very special and great men are the reasons behind the event. One was just beatified this past weekend in England by Pope Benedict XVI, the other a Venerable Pope whose life and legacy will forever live on in the hearts of millions, the last is the focus of Salt + Light's newest documentary, God's Doorkeeper, Saint André of Montreal a remarkable Canadian who will be declared a Saint in October. 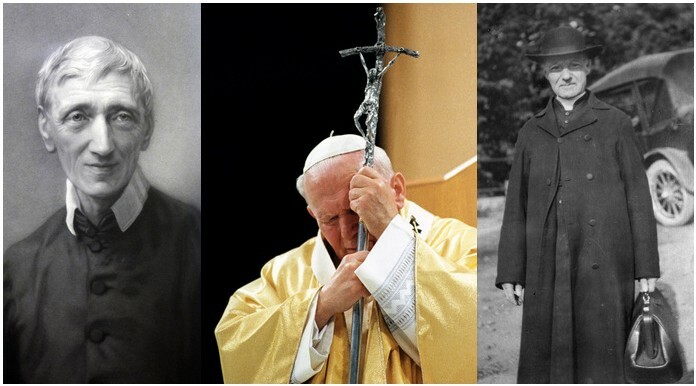 Cardinal John Henry Newman, Pope John Paul II and Brother André Bessette are all excellent examples of what it means to be a Saint of the new millennium. The Newman Centre is honouring these three men by hosting the event on tomorrow night, September 23rd, at 6:30pm for students and the local community. Father Rosica will speak about Brother André and his upcoming canonization. We’ll be showing our trailer for the upcoming documentary on the life of Brother André Bessette. He will also speak about Venerable Pope John Paul II and the lessons he can teach us about aspiring to be Saints of the new millennium. Deacon Michael Knox, SJ will speak about Cardinal Newman and his recent beatification in the UK. Cardinal Newman is the only candidate for Sainthood that the Holy Father has personally beatified as Pope. To learn more about the life of Cardinal Newman watch Kris Dmytrenko’s Catholic Focus: Cardinal Newman -- Heart Speaks to Heart. So if you find yourself in Toronto tomorrow, Thursday September 23rd, stop by the Newman Centre for the event. It begins at 6:30pm If you’re not in the area, I'll be writing about the evening in the future.